COMMENT: Mr. Armstrong. Everyone knows why the bankers hate you. They say you have way too much influence. 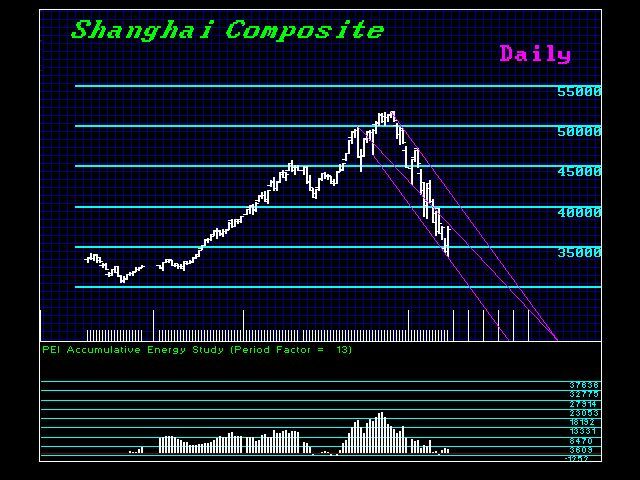 You come out and say Shanghai should bottom tomorrow and it does. Obviously, you are the man no matter what you say. REPLY: We have a model that is great on time and price, but that does not mean that I manipulate the world by influence. That presupposes that market manipulation can reverse trends. That is impossible; any manipulation is within the trend. You cannot stop a freefall or a rally by influence, which has failed countless times. I am tired of people blaming me for everything everywhere. Our Energy Model bottomed in advance, as it always does below par, warning it was overselling. The first Daily Bullish stands at 4080390 so until that is elected, we do not yet have a confirmation of a two-week rally rather than a two-day knee-jerk reaction. It was 19 days down; right on target in time and as was our target week of July 6. The Directional Change was on the July 9, so everything simply lined up. Blaming me for influence rather than looking at the market and saying, “Gee, perhaps he discovered that there is a hidden order!” will only prevent you from seeing reality. Any programmer will tell you it is IMPOSSIBLE to create a random number generator. A cycle will always emerge no matter what you do. Breaking the code is what they did during war to defeat enemies. I do the same to decipher the hidden order in market movements. Blame me and you miss the whole reality that surrounds you.